Do you like Slither.io? Share it with your friends. 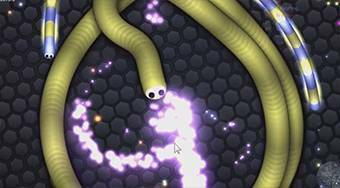 Slither.io is a very addictive multiplayer online game inspired by the legendary Agar.io. Your task is to navigate your snake in the game field and to eat colored lights in order to extend your mass. Once any snake crashes into another snake with his head the game ends for him and he becomes food for other snakes. In the lower right corner of the game you can see the navigation map that tells you what is your position and where to find more mass and more snakes as well. The main goal is to achieve the highest score possible and to dominate the whole snake nest. The game begins by generating the snake in his basic (smallest) size somewhere in the game field. Once you have collected some first light pixels and your snake is a bit larger you can start using the speed boost and attack other snakes. Each time you accelerate your snake looses somewhat of his size and leaves a tiny portion of his mass in the form of colored lights behind. Speed up your snake by holding the left mouse button. In the early stages of the game with the snake of size around few hundred points you'll already have enough power for continuous acceleration and your snake also won't be too massive to loose maneuverability. At this stage it's beneficial to move around the middle of the game field as most of other snakes gather there which leads to frequent collisions due to which you can relatively quickly increase the size of your snake up to several thousands points. Once your snake grows to about 10,000 points it is not practical to move in very active areas as your snake has already lost his perfect maneuverability and therefore he faces an increased risk of collision with other snakes. Often you can get into a situation where there will be a number of snakes around and you will simply not be able to avoid the collision because the turning radius of your snake is too large. We recommend here to move more on the edges of the active zones where you can try eating smaller snakes systematically by catching them into traps. You simply have to create a loop with your snake and lock other snakes inside. It's useless to start hunting medium snakes if your snake has not reached a reasonable mass yet as you will hardly create a closed loop. This game stage is really fun and enjoyable but also quite challenging. Do not waste time catching tiny snakes as the entire process of capturing another snake carries an increased risk of collision. Mostly try to catch snakes at the size of at least a thousand pixels or more. If you go through the middle stage of the game successfully by eating enough mass and your size is now more than 20,000 points you can start the next phase. This means you will have to create large loops to cover larger areas with no chance for escape for other snakes. You will most likely catch more than one snake at once and the won't even know! At this stage it's recommended to move rather at the edge of the actual game field. Try to make larger enclosed areas in which other snakes gets trapped. Initially try to avoid using the acceleration which can put other snakes on alert that they might be endangered. Once you are close to surround the area and also confident that snakes inside have no chance to slip through rather accelerate to lock the area quickly. In this way you can play the game until the end. The more mass your snake have the larger area you can rule! In any case avoid areas with a high incidence of snakes because with your dimensions there is basically no chance to defend. If even the tiniest snake is approaching you it's advised to accelerate quickly or change direction of movement to avoid collision. Everyone will try to get you now! It is best to strikingly create large enclosed areas in which you can trap a larger number of snakes. Finally be sure to share your score within the comments below the game! Editorial record is almost 70,000 points! Have a lot of luck, fun and patience with the amazing game Slither.io! Editor's rating: 95% - We rate the game with high score because it is extremely fun and highly addictive, but sometimes lags, so it receives a 5% down.